Surnames come in many different ways. Some are from professions, others indicate relationships (Johnson, for instance would at some distant point have been the son of John). Others derive from places, and that particular Meaning Of Surnames can be very useful in Genealogy, or at least if often can. If the place name is very specific, especially if it’s a village, rather than a town, it can give a particular point of origin for your family, or at the very least offer an indication. Make no mistake, those obscure village names are still in use as surnames, many centuries after the fact – the problem lies in connecting the dots between now and then. Sometimes, as with the names of places, surnames can tell us a great deal. More often, though, they can only provide a general level of information. Let’s say, for instance, that your last name is French or Moore. From that, genealogy can conclude that at one point you had foreign ancestors (Moore comes from Moroccan, as do its many derivatives like, believe it or not, Morris, which started out as Moorish). That’s hardly exact, is it? But it’s a clue. Some names, though, are even more nebulous, like Hill, Dale, Wood, Burns (streams) and so on – place names of a sort, but taken from geographical features. You will sometimes find town names or their derivations as surnames – Newport, York, Sheffield, and so on – all of which would indicate that many generations ago your ancestor was born, or at least spent a long time, in that place. It’s a useful clue, but more tantalising that promising. The meaning of that surname tells you something, the trick is find out exactly what, and when it’s relevant. By around 1400, surnames had become fairly fixed, and 100 years later were definitely so; even if someone named Cooper no longer made barrels, the name stayed in the family unless it was changed deliberately (which did happen – with unfortunate regularly for genealogy). Even a name like Thorp or Thorpe harks way back, as it means village or town (place names in the North of England ending in -by are a legacy of the Vikings, meaning farm). Back in the Middles Ages, many serfs were essentially the property of those who owned the land, and some took those owners’ names as their own (much as slaves did in the West Indies and the US). Having a name that seems to derive from a place could also mean that the name actually comes from the owner – whose estates would be vast. Sometimes it’s very obvious to see a link between a surname and a place. Take Rastrick as an example. It’s a small town, once a village, in West Yorkshire. It’s certainly not a common name. Anyone named Rastrick would almost certainly have roots there if you can use genealogy to go back far enough. 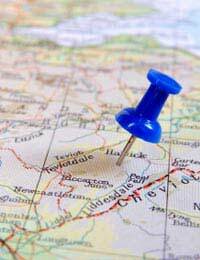 The smaller the place and the more specific the place name, the better for making your connection with that surname – assuming you can find your way back through the generations, which isn’t always easy. But in genealogy, every strong clue is useful.